Have you ever seen the episode of I Love Lucy where Lucy gets a job in a candy factory? The candy rolls off the assembly line so fast she can't package it. She ends up covered in chocolate and out of a job. These days, trying to stay on top of perfume launches is like working at Lucy's candy factory. As is also true at the factory, so many of the fragrances are the same. This candy tester is happy to report the new Grossmith line stands apart. They're different not so much because they're wildly compelling, but because they smell of a different time. Grossmith, an English perfume house, first opened its doors in 1835 and closed sometime in the early 20th century. The great grandson of its founder revived the house this year with the help of Roja Dove from Harrod's Roja Dove Haute Parfumerie. 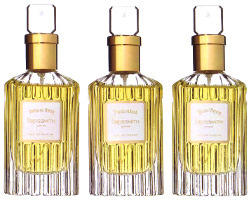 Grossmith has released three of its original fragrances. Despite the perfume house's name, which sounds like it could front canned peas, each fragrance's name is exotic: Phul-Nana, Shel-el-Nessim, and Hasu-no-Hana. Phul-Nana, which Grossmith's website says is Hindi for ‘lovely flower’, has notes of bergamot, orange, neroli, geranium, tuberose, ylang ylang, patchouli, benzoin, cedar, sandalwood, opoponax, tonka bean, and vanilla. Grossmith says Phul-Nana, created in 1891, "paved the way for 'oriental' fragrances to follow." To me it smells like an earthy, ambery fougère. Most of the rest of the notes are lost on me. It's fresh and heavy at the same time. Although Grossmith lists it as a feminine fragrance, men could wear it easily. Shem-el-Nessim, created in 1906, is Arabic for "smelling the breeze," and has notes of bergamot, neroli, geranium, jasmine, rose, ylang ylang, orris, musk, patchouli, cedar, sandalwood, heliotrope, and vanilla. Grossmith makes a big deal about the expensive Florentine orris in Shem-el-Nessim, and it is sweet and creamy here rather than vegetal. Shem-el-Nessim, to me, starts out smelling like the stems of wet spring flowers — flowers from old Flemish paintings, then transitions into sandalwood mixed with the vanilla-like smell of heliotrope. Hasu-no-Hana, "the scent of the Japanese Lotus Lily," was created in 1888. It has notes of bergamot, bitter orange, rose, jasmine, ylang ylang, iris, patchouli, oakmoss, vetiver, cedar, sandalwood, and tonka bean. Hasu-no-Hana smells to me like a spicy floral with a hint of cedar, and I'm surprised not to see carnation or clove listed among its notes. Of the three scents, this one is the warmest. It's also the one that smells most to me like something you might mix up at your local bath shop. Grossmith says that each of the fragrances was recreated with as much fidelity as possible, given current fragrance regulations and the availability of materials. It tells. These perfumes smell old fashioned: dense and contracted, rather than expansive and bright. They smell expensive, but almost as if someone were playing with rare essential oils rather than with the magic chemicals perfumers use now. For a visual comparison, the Grossmith fragrances each smell like an oil painting darkened by age. If you rub its surface with a soft cloth you see that one of them is a springtime landscape, and another is of a lady's boudoir, but at a distance they are similar. Modern perfumes, on the other hand, can feel as distinct as an Ansel Adams photograph or an Andy Warhol portrait. All of the Grossmith fragrances have moderate to low sillage, and they last for a solid eight hours. According to Grossmith's press release, Phul-Nana, Shem-el-Nessim and Hasu-no-Hana are available in 50 or 100 ml Eau de Parfum (£95-185, a coffret of all three in 50 ml is £310) or in 10 or 100 ml Parfum ( £110-425, a coffret of all 3 in 10 ml is £365), or in 85 ml Parfum in a limited edition Baccarat bottle etched with pure gold. For buying information, see the listing for Grossmith under Perfume Houses. I recall reading about how this perfume house was going to start creating again. Very cool. I’m intersted to try, because I do so love old fashioned perfume, but am afraid of how much I have to test from my last Luckyscent order. Plus, I can barely smell anything due to a stupid headcold. Sorry about your head cold! Yes, these are fun to smell because their style is so different from what you smell (if you could smell!) now, except maybe Phul, which is more like a traditional fougere. At the risk of sounding cliche, I have felt your pain, Andrea D. I am just getting over the same curse and thank God it happened just in time because my Luckyscent samples came shortly after. Get well soon! Those bottles are stunning; every time I see them highlighted on a perfume blog I want one. On the other hand, the only one whose notes actually appeals is Shem-el-Nessim. And even then, I’m not sure – I’m saving pennies for a decant of Carnal Flower and possibly one of Cuir de Lancome, so I’d rather not find something ELSE to want! Any one of these that you would actually wear, Angela? Or was it a case of “I’ve tested these samples and now I’m done with them all”? Shem is the one I’d most likely wear and the one that pulled me in most, but I don’t have a huge desire for a bottle, fortunately. I’m glad I smelled them, though, just for historical reasons. I sent a message to mals86 at MUA. If you don’t get it, contact me about the CF. I’m julia941! I hope you get well soon, Andrea D. Angela, thanks for the review. Those prices are scary, but the juice sounds beautiful. I’ve discovered throughout this perfumista journey that I love “old-fashioned” perfumes that smell like… well… perfume. I love Divine and HdP for that very reason, so these do look intriguing. But it would be difficult to find room for a full bottle in the budget if I fell in love with it. Hmmm… Time to bust out the split calculator. These smell even more old fashioned than those. There’s no hint of diffusive aldehydes or the darkened, musty flowers of, say, Narcisse Noir. Instead, they smell almost primitive. Deliciously expensively primitive, though. This is what makes me think I need to smell them. I was trying to find a good reason not to because of the price, but if you think they smell like a good re-creation of a good perfume from the earliest days of modern parfumerie I want it. I really like “historical” samples. Just before Jicky. How do you think they compare to other perfumes released around the same time like Jicky, Apres L’Ondee? They almost smell pre-modern to me. Apres L’Ondee, by comparison, is super modern. The Grossmiths are almost like diluted blended oils–but really nice blended oils. Angela, thank you for the review. I would love to smell these because they sound like they have a lot of depth to them. The only thing is each of them have cedar as a note and I don’t think I like cedar. Regardless of that, I am most interested in Shem-el-Nessim because I love a soft iris. Is it powdery at all? I really don’t get distinct cedar in any of them, and only a hint of it in Hasu. Shem’s iris really doesn’t smell like iris I’m used to smelling, either! It does get a tiny bit powdery, but not at all like, say Iris Poudre or any of the face-powder, girly irises out there. Hi, Angela! Beautiful bottles and was itching to try…until the ‘canned peas’ remark. Now I’m laughing! I love the bottles, too. They’re gorgeous! Angela, love the Lucy’s candy factory comparison! I’m glad you guys keep on top of it so I don’t have to. Beautiful reviews, as always; your visual comparison is compelling. I hope I have the opportunity to smell them, they sound beautiful to me. They’re so interesting to try, because they’re so of another time, well before even the vintage fragrances I love. SunnyFunny- Who is that a photo of next to your name? It looks like a band. The patchouli is barely noticeable, even after it sits on skin for several hours (which is when patchouli usually strikes on me). If you do try them, let me know what you think! Thanks for the reviews, Angela. The exquisite bottles caught my eye a while ago but it sounds like they probably wouldn’t all that wearable for me. I wonder how well they are selling. Time will tell, I suppose. When I say that they’re old fashioned, they’re not funky in any way. In fact, I’d say they’d be very easy to wear, easier than, say, some of the early Diors. Although, of course, they may not be to your taste. Hi Angela, and Happy New Year in advance! However… Shem! Creamy orris? Wet spring flowers? Sandalwood? Heliotrope? Old fashioned?! Sign me up! I’ve already posted a request for interest on a split site and I’m ready to host! Haha! Thanks (I think?) for reminding me of the line and also for giving some information and your impressions. Enjoy your week and the NY holiday! Split, you say? Get thee behind me… I need Carnal Flower, I don’t need anything else. I need Carnal Flower, I don’t need anything else. Self, repeat mantra as necessary. Heh. I may need to get Agent Daisy’s assistance on this case. Carnal Flower is so wonderful. You really need some of that first (and so do I!). I hope you test it first! It’s a strange, stemmy fragrance. It is my favorite of the line, though. If you host, you get the bottle, and that’s a nice inducement. I thought exactly the same thing about Shem, and when I tried it, it did not disappoint! Rose en Noir! I haven’t tried that one. Just by the name, I’m guessing a rose/patchouli/oud thing? I don’t get any patch at all from it. It’s mostly just sweet and warm to me, although my husband (who has a better nose than I have for picking out individual notes and even intended nuances) said: “It smells like roses and charcoal.” That was before he even knew the name of it; I just stuck my arm out and made him sniff. It has a little of the dirty L’air de Rien MH base to my nose, which is why I like it so much. ‘Dense and contracted’ was kind of what I was imagining with these, although I could not have expressed it as well. I wonder if most fragrance used to have this characteristic because the substances that would give a scent lasting power had not been developed. So the fragrance had to pack in a big punch to start with, in the hope that it would last a few hours. Jicky is about this old. I wonder if it has been brightened and sharpened over the years? The formula must have changed after all this time surely. Anyway, thanks for the reviews. I was very curious about these. When I say they’re dense, they’re not particularly loud, but they’re not diffusive and roomy–you know what I mean? It’s really hard to express. It’s like they play on a limited spectrum somehow, like a chamber ensemble compared to a polyphonic symphony. I’m sure Jicky has been recalibrated plenty of times over the years. Think of the civet alone. I’m so glad you reviewed these Angela. I’ve been curious about them since reading about the revival of the line with Roja Dove – I have to say that really piqued my interest! Sounds like they really did these right – smells expensive and of good quality you say? How marvelous. The bottles are gorgeous. They are pricey, but with good reason, it would seem. Hope you had a wonderful holiday! I hope you get to smell them sometime! It’s like riding in a really nice Model T. You might prefer the comfort and speed of something newer, but the T is a great experience. I’ve smelled these twice while I was in London, at Roja Dove’s and at Fortnum and Mason’s. I must say they smell convincingly… archeological. Interesting, definitely pre-modern — next to them, Jicky is cutting-edge. Apparently they’re selling quite well at F&M’s. It sounds like we had a similar reaction to them. They’re easy to like, though. I can see why they’d do well. At the same time, I guess I’m used to–and like–the broader palette in use now. Angela- When you mentioned the “I Love Lucy” candy factory episode, I immediately had thoughts of the situation being rewritten and pictured myself stuffing all kinds of perfume samples down the front of my uniform just to keep up. Then when I got fired, I’d get home and really let something off my chest! And I’d smell good doing it too! Well, with this year’s releases some of the time you’d smell good, at least. But wouldn’t it be fun unloading all those samples? Wonderful review as always, Angela. I loved the analogy to the I Love Lucy episode – one of my favorites! And that’s exactly how I feel about testing/sampling the new releases even with weeding out the obvious ones I won’t like. These certainly do sound beautiful and you say “old fashioned” and I’m your girl, but yikes those prices! LOL! I would never skip an Angela review, although you’re right – I’ll skip these. There is something wonderfully historic about it, true! Phul-Nana is FABULOUS! It is floral and spicey and sweet. It lasts too. Bought a big bottle in Fortnum & Mason. Love it! Shem-el-Nessim is quite similar to Phul-Nana, very similar actually. A little more spicey. Hasu-no-Hana is the most delicate floral of the three, but that is not to say weaker or less fragrant. They are all three very similar but for me Phul-Nana has the X-factor. All three are very womanly. “X factor” is such a good term! It sounds like your mother’s Phul Nana wasn’t the same as the one I review here. I don’t know any other ones. I hope you find it and can re-experience that smell! Have you tried their latest fragrances? I’m looking forward to spending more time with the samples I have.